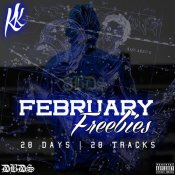 Check out the 27th single of KK’s #FebruaryFreebies series entitled “Racks On Racks (Freestyle)” featuring Brydon! The 28th and final single of this series will be releasing later today. Check out the 19th single of KK’s #FebruaryFreebies series entitled “Attitude” featuring Brydon! Check out the tenth single of KK’s #FebruaryFreebies series entitled “Pound Cake” featuring Blake & Brydon! Check out the ninth single of KK’s #FebruaryFreebies series entitled “Pre” featuring Brydon & Just Jay! ARE YOU Brydon? Contact us to get a featured artist profile page.